Located at the Badaling Section of the Great Wall, the Beijing Badaling Safari World is the largest mountainous region wild animal zoo in China. 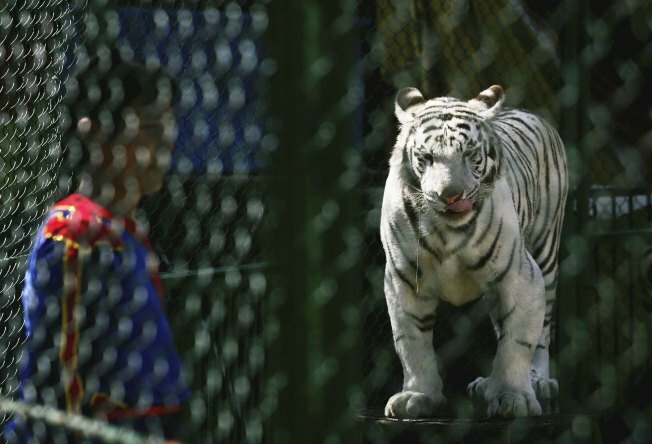 BEIJING — A Siberian tiger at a wildlife park near Beijing attacked and killed a man who climbed into its enclosure thinking he found a shortcut down from the Great Wall, a park official said Sunday. The 20-year-old man, surnamed Guo, had been hiking with two other people on the wall when the group decided to jump down to save time on the descent — unknowingly landing themselves in Badaling Wildlife World's tiger enclosure. The tiger pounced on Guo, knocking him down and clamping its jaws around his throat, said a wildlife officer who gave only his surname Wang. Guo was killed instantly. The Siberian tiger, also known as the Amur, Manchurian or Ussuri tiger, is one of the world's rarest species. They are the largest of the big cats, weighing up to 500 pounds (226 kilograms). There are believed to be about 400 of the critically endangered animals in the wild.